Our phones all rang at 4 this morning. We needed to be up and about to board the bus at 5, and our flight at 7am. The hotel served us coffee at reception and sent us on our way with breakfast in a bag. It was pretty welcome. Our flight to Johannesburg and then onward to Livingstone, Zambia was uneventful, though some of us were feeling quite unwell and Lorrie had the experience of being moved terminal to plane via the food loader truck. Oh yes, there was an event - when we were in the departure area at Cape Town, waiting for the flight to Jo'burg, there was an announcement "would passenger Hatt please report to the desk immediately." We both rushed over, and Larry was taken outside to where his suitcase was lying on the ground. There was much commotion among the baggage handlers because his suitcase was buzzing! It was his electric shaver, the one guaranteed never to accidently go on in your luggage. So he turned it off, wrapped it in a shirt and repacked it on the tarmac. Gave everyone a bit of excitement. A bus and driver met us at the airport and delivered us to the wonderful Royal Livingstone Hotel. It's definitely my favourite so far! We were greeted with ice tea on the lawn and could watch monkeys cavorting as we sipped. Our rooms are smaller than the other places, but very comfortable. We and Lorrie have rooms off the same little alcove. We do have to remember not to drink the water here, though. At 4pm we left for the river, where we boarded the African Queen for a 2-hour sunset cruise. The Zambezi is a beautiful river; sunset was glorious and we saw many hippos and some elephants through the trees. On the hotel grounds we saw giraffes and then elephants along the road. There are many birds everywhere. Even after dark it was very warm outside. Click below for full size show. Having slept most of the evening, I was up and out on our terrace by 5:40am. My reward was to get a close view of 6 zebras on the lawn off our patio! They were just stirring and starting to move off for the day. Two of them walked within 5 metres of the terrace. The monkeys were just beginning to scamper about as well and I could hear many birds, though I didn't see any. The sound of Victoria Falls is ever-present, and it's also obvious why we're told to use insect repellant. I had forgotten at first, but quickly realized my mistake and got it on. We set out on a morning walk but in fact walked to Victoria Falls before breakfast. The low amount of water was disappointing, but the falls are still beautiful - all broken up into narrow cascades along a long cliff. This is the end of the dry season so it's at its minimum. After a lovely, relaxed breakfast we checked out of the hotel and rode back to the beginning of the path that leads to the falls. 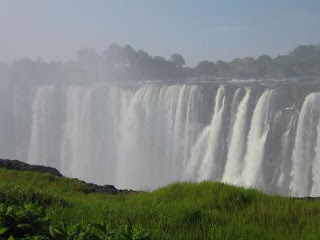 The light was entirely different, so it looked different and we could see the edge of the main falls that one can only see frontally from the Zimbabwe side, a side which is not currently safe for tourists. We then headed for the Botswana border. Before we got to the border post, we left our mini-bus behind and boarded a small boat to cross the river - it had made a first trip taking our luggage and a few intrepids to watch the beached luggage on the first trip. The driver pointed out that in the middle of the river, we were in "No Man's Land" - where 4 countries (Zambia, Namibia, Botswan and Zimbabwe ) come together. It was quite an experience sitting in the vast wasteland and seeing probably at least 100 trucks waiting to be taken, one at a time, across the river. They often wait a day or even two for their turn. So there were people down at the river washing and drinking. It was dry, hot, and dusty. Also while waiting on the Zambia side, it was interesting watching the ladies returning from Botswana loading unbelievable packages on their heads and then carrying heavy bags to someplace up the road in Zambia. One had a full bag of cement loaded on her head. On the Botswana bank we were met by Chobe Game Lodge safari vehicles with high seats and open sides. We had to get out at the border post and have our passports stamped, as well as walking through a disinfecting bath for our shoes, while the vehicles drove through a puddle of the stuff. The ride into the Chobe Game Lodge was amazing. We saw all kinds of wildlife on the way and we hadn't even started yet! Dave Wilkes of our group said that he saw more game on the trip in than he saw on his 10 day Kenya safari that visited 4 parks. We were too late for the afternoon game drive, so we had very late lunch and unpacked, then went for a swim and a great "Hall Party" followed. Dinner was on the lawn with great music and dancing under torch light. I love this place - very comfortable and peaceful with beautiful surroundings. Cathy was shocked to encounter a wart hog on the lawn on her way to swim. We all saw it later. Wake up calls at 5:30 followed by coffee and snacks before we loaded up the safari vehicles for the morning excursion. What an amazing number of animals and birds we saw - elephants (100s), giraffes (dozens), cape buffalo ( dozens ), impales (many 100s), kudus ( dozens ), hippos ( dozen ), a mongoose (one kind, and then a herd of a second kind), a genet, a jackal, many zebras, many warthogs, hundreds of baboons, many buzzards, cormorants, African Fish Eagles, Tawny Eagle, Kites, Guinea Fowl (so many they are known locally as Chobe Chickens ) and, most exciting, a pack of 15 wild dogs which passed within feet of our vehicle. Our guide, Mr. Bean, told us that they only see them once or twice a month. I'm sure there were others but we lost track. It was exciting just to see them. Back to the lodge for breakfast, then onto boats for a Chobe River safari. Once again - totally amazing, Elephants and impala (cautiously) drinking from the river near crocodiles lazing on the bank. Even more birds and animals including most of those we saw in the morning, plus swallows, storkes, louries, ibisis, etc. A large number of elephants crossed the river to Namibia while we watched close by. Elephants without Borders, says Mr. Bean. After lunch, a brief rest, re-application of sunscreen and insect repellant and back to the safari vehicles. Wow! what an afternoon! I can't begin to give a complete list, but there were lots of birds - the most beautiful was the Lilac Breasted Rolleo, and then there were Maribou Storks, Vultures, Black Stilts, African spoonbills, Egyptian Geese, Openbilled Stork, and so on. Of course thousands of guinea hens, many many elephants, lots of giraffes and baboons, warthogs, kudus, impala, pukus, Chobe Bushbuck and Ta Da, Ta Da... a lioness. I chose that moment to mess up my camera settings, but Larry was able to fix them, and get a great photo, even at about 100 metres across the water. Mr. Bean had been about to serve us wine and appies on the sunset beach when he got a call about the lion, and so we raced westward to the vantage point. So we missed the sunset party but were more than amply rewarded. Then back to the lodge for dinner and bed. Today Mary Ellen said "How many times can you say WOW?!" That was just the kind of day it was. It got off to a roaring start (:-)) when we saw two lionesses at their leisure in a field beside the road. We watched them for awhile, and then continued on our way. I had decided that I'd taken pictures of everything I'd seen, and that I was going to use binoculars today, and only the small camera, while Larry enjoyed himself with the bigger new one. I also continued to quiz Mr. Bean, our guide, about the many birds we saw, and tried to learn a few of their names. I took along the hotel's checklist of local flora and fauna and checked off everything we saw. The list is far too long to reproduce here, but suffice it to say that it was amazing! Many of the same things as yesterday of course, but a few new ones, including those lionesses. We did a drive this morning, followed by a boat trip, in the opposite direction from yesterday. We were in the midst of many hippos at one point on the river, and spent a lot of time in the midst of families of elephants, watching how they moved and especially the relationships between adults and calves. It was really fun. After lunch was time for a short swim (in the pool of course, not in the river!) and then an afternoon drive. We began with a juvenile hyena, who gave us quite a show by the river. It drank and peed at the same time, then wallowed in the mud for awhile. Later we saw a jackal, and finally --- tada! the icing on the cake -- those same two lionesses and their three cubs! But wait! Wait! There's more -- if you phone now -- we saw the lion just at dusk, and from a distance, so we got no viable photos, but we really really did see him! What luck we've had. We saw everything significant here except the leopard. It was tough saying good bye to Mr Bean, though I think we'll see him before we leave in the morning. We had a good time in the bar, then a nice bbq type dinner, like at the Manchurian bbq in China, where we filled our plates with the makings, and they were grilled to order for us. Yum. Then a bit more bar time and off to bed. We slept in until 7 today and then packed up for a day of travel to Johannesburg, RSA. Lorrie hitched a ride by plane with Elsie, Brock and Sally-Jo. They had a spectacular view of Victoria Falls as they came into Livingstone, Zambia. So we all await the photos. The rest of us rode back to the river, crossing in safari vehicles. Larry and I crossed the Chobe River from Botswana to Zambia first with the Wilkes and all the luggage, to guard it while the little ferry went back for everyone else. While we waited, we talked with the porters, who were also selling carved animals and other things. We gave one of them my Canada pin and bought a few things. They told us they were from an artisan's village that had been established after their own village was washed away in a flood. They like Canadians because Canada was instrumental in rebuilding the village. One guy wanted us to pay for our purchases with Canadian dollars so he could show his old grandfather what Canadian money looked like. Eventually we were loaded up, cleared the border formalities and drove off to Livingstone airport. Along the way we were amazed by the beautiful jacaranda trees all dressed in purple blooms. Our flight to Johannesburg was uneventful. the trip through Jo'burg Airport was interesting. First, the immigration officer extracted a promise from us that we would stay until we'd spent all our money, then come back when we had more to spend. He was hilarious. Then a couple of clowns on unicycles gave us free packages of macadamia nuts ( promoting the duty-free shop ). Then the police stopped everyone to look at the passports of all the women. Finally as we neared the baggage carousels, a sniffer dog and handler (Dept of Agriculture ) came up to us. The dog sniffed everything and then focused on my tote. "Have you any food?" said the handler. I had had apples, but finished them in the previous airport. The handler said that would have been what the dog smelled. The dog was amazing and clearly wanted a treat for its successful find ( and got one ). We arrived at the hotel in time for freshening up and resting before heading out for dinner. We saw some of the very prosperous parts of Jo'burg and entered one of the most beautiful restaurants I've ever seen - Vilamoura. Wow! Yet again!. Quite a contrast to dusty, bumpy roads and warthogs. Even better, the food was as great as the surroundings. We celebrated Sally-Jo's birthday with a cake and then ceremonially inducted Frank as an honorary Canadian. He was gracious and funny as always. We'll miss him when we say goodbye tomorrow. We were off to the airport in good time as several people were claiming VAT refunds. That proved to be quite a hassle for them, and in many cases they received almost nothing for their efforts. We had bought so little that we didn't bother and were glad we hadn't. We spent our last few Rand at the airport and hugged Frank one last time. What a sweet heart he is, besides being a terrific guide! In Nairobi we found an airport that harkened back to Toronto International of 50 years ago. Lots of stores seemed to have been added along a curved corridor and the gate was between a cafe and a shop. We had beers and soft drinks, pretty well taking over the seating space, then walked across hot tarmac to the smallish plane (Bombardier - made in Canada). We had good views of Kenya and Tanzania on the flight, and Mt. 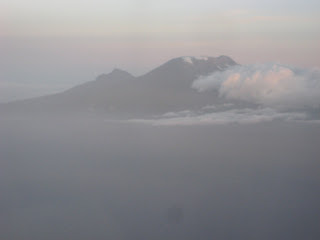 Kilimanjaro and its sister mountain were dramatic in the sunset. Kilimanjaro airport is small and it took us awhile to complete health forms for H1N1 symptoms, show our yellow fever certificates, complete immigration formalities and find luggage. Unfortunately 3 people in our group were missing bags. Worse still, several students, here to climb Kilimanjaro, were missing theirs as well. Finally, we were met by our new guide, Jane, and welcomed to Tanzania. After a long wait to file claims for the luggage, a small bus pulled up, our suitcases were hoisted to the roof and tied on, and we were on our way. The road was very rough and the night was black as pitch. Other vehicles were either speeding along with horns blowing, or crawling and being towed. There were people walking and bicycling beside the road, and lots places where parties seemed to be underway. finally we arrived at the Arusha Hotel and after a nice but very late dinner crawled under mosquito nets to sleep. We were all very tired. and als9o learned to play golf and tennis. Our luggage was loaded and we climbed into 4 land-rover safari wagons for the ride to Lake Manyara. Lorrie, Cathy, Dave, Larry and I rode with Boniface. He told us that the last 2 years and especially this past year, the wet season hasn't provided enough water, and so the Masai are particularly in trouble. The cattle are dying from lack of food and water and cattle are their livelihood. Part way along the road, Boniface got a call that the 3 missing suit cases were on their way. Cathy, Gail and Elsie were delighted to learn that. We stopped at a very large Curio shop to wait for the cases and shopped until they arrived. I've already expanded my suitcase; I think Larry will have to do so as well. Along the highway we saw many Masai villages. Some houses are round and made of thatch and sticks, while others are brick or cement block and iron. The latter apparently belong to those who've gone to the city and have some cash. We saw heards of cattle and goats and many many beautiful, graceful people walking or riking bikes. they all wore brightly-coloured clothing - either kangas or western dress. The landscape looks completely desiccated and we saw swirls of dust everywhere. There were some larger towns where shops and market were concentrated. Eventually we turned and drove up a long mountain road to the Lake Manyara Serena Lodge. 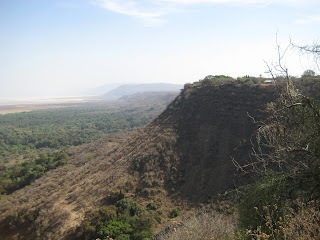 We could see Lake Manyara stretched out below as we climbed. The lake is greatly reduced in size with salt deposits over large areas that used to be lake. As a result, the flamingos have left. After a quick lunch, we had a safari in the Lake Manyara National Park. Boniface pointed out some of the wildlife, but we've become pretty good spotters ourselves. We saw giraffes, Vervet monkeys, olive baboons, wildebeest ( by the hundreds ), an elephant and many hippos. The park is lovely and green and fresh compared to what we saw along the road. We had another bit of bad luck with a vehicle today, when we had a flat tire in front of the hippo viewing area. The drivers of all the vehicles from the Lodge pitched and changed it quickly. Before dinner we enjoyed the singing of a choir by the pool. A great African sound with 15 or so singers and a keyboarder. For dinner we trekked though the dark to an open area set up for our dinner. One of the guides showed us some of the constellations of the southern hemisphere and then explained our location here on the western edged of the eastern branch of the Great Rift Valley. It's an interesting place. We were the first to decide to return to the lodge and a guard with a stick for a weapon and flashlight walked us to our lodging. A long, lovely, but tiring day.